As Luke Och quoted Carol Field, “Bread is made from just flour, water, salt, and yeast. Just as the earth is made from just earth, air, fire, and water.” Och also tells his readers that, "It is important for the baker to understand the anatomy and molecular changes that these ingredients go through during bread making." There is nothing like the smell, the aroma, of bread baking in the oven. Yet, for many people, the idea is that bread comes in a plastic bag, pre-sliced and ready to serve like the cardboard or Kleenex that it resembles in taste. In our busy lives, we tend to think that there is no time to create something as eloquent (as well as essential) to our daily lives. Yet, upon studying Och's book, even the least talented of bakers should be able to concoct a decent loaf of bread (or two). Och has baked breads of all kinds for years. 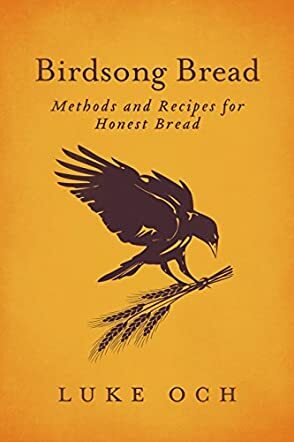 He has studied different bread types, different ways of making bread, and he has created his own basic bread recipes, which he shares with the reader in this small, but very concise and well laid out book, Birdsong Bread. You many wonder at the title. I know I did. But after reading Och's description of different breads, different flours and grains, and different seeds that can be used in breads, it almost reads like a list of ingredients that would keep a bird content. But, more importantly, his patient and basic description of the history and the background to baking great breads makes the entire process sound as easy as a bird's song. This little book is a gem for both the established and the would-be bread baker. Coupled with interesting and informative illustrations, Och has provided his readers with not only a basic understanding of how to make good bread, but also how one can easily become adventurous to create unique and unusual breads. An excellent book. Well done!